Braving arctic temperatures and a brutal wind chill, a Russian Soyuz spacecraft roared to life and streaked smoothly into orbit Wednesday, carrying a veteran three-man crew on a two-day flight to the International Space Station. 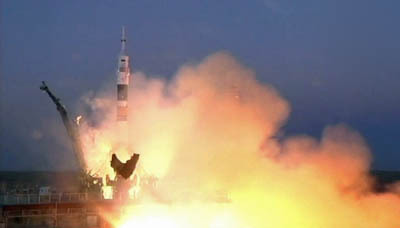 With commander Roman Romanenko at the controls, the Soyuz TMA-07M spacecraft climbed away from its launching stand at the Baikonur Cosmodrome in Kazakhstan at 7:12:35 a.m. EST (GMT-5; 6:12 p.m. local time), roughly the moment Earth's rotation carried the pad into the plane of the space station's orbit. Trailing a fiery jet of brilliant orange exhaust, the workhorse rocket arced away to the east through a clear evening sky. Spaceport workers, station managers and family members, bundled up against temperatures near zero degrees Fahrenheit and a wind chill of minus 30 degrees, enjoyed a spectacular sky show as the rocket climbed away. Live television views from inside the cramped command module showed Romanenko, strapped into the module's center seat, monitoring cockpit displays as the rocket raced toward orbit, flanked on the left by Canadian astronaut Chris Hadfield, serving as flight engineer, and on the right by Thomas Marshburn, a NASA physician-astronaut. All three space veterans appeared relaxed and in good spirits, occasionally waving and smiling as the rocket accelerated. "I am one lucky dude. I can't imagine a better crew to fly with," Marshburn said before launch. Eight minutes and 45 seconds after liftoff, the TMA-07M spacecraft was released from the booster's third stage, its solar arrays deployed and Russian flight controllers radioed congratulations for a successful ascent. "Congratulations on the launch," the flight director radioed. "We're getting the telemetry here, it's all good. So good work. It's all normal." "Thank you very much," Romanenko replied. "We are ready to work, that's why we're here. It's nice to know everything is well telemetry wise." Romanenko, a second-generation cosmonaut, will oversee an automated approach to the International Space Station, docking at the lab's Rassvet module around 9:12 a.m. Friday. Standing by to welcome them aboard will be Expedition 34 commander Kevin Ford and Russian cosmonauts Evgeny Tarelkin and Oleg Novitskiy, who were launched to the lab complex Oct. 23. Marshburn, who visited the station during a 2009 shuttle mission, said the crew was looking forward to celebrating Christmas in space. "I'm going to bring up some classic holiday food in dehydrated and well packaged form," he said. "It's already up there on the station, so we'll have a little Christmas dinner. There are some decorations and ornaments, I believe, that are flown up, some that have been on station for years and some that we've added. So we'll have a little celebration while we're up there." The crew faces an intense post-holiday schedule that includes a full slate of scientific research, routine station maintenance, a Russian spacewalk and the arrival of Russian and European Space Agency cargo ships. Two U.S. supply craft also are expected, making commercial flights under contracts with NASA. "I'm looking forward to getting back into space, experiencing zero G and adapting to it," Marshburn said before launch. "We've been training a long time on these experiments and I'm looking forward very much to getting in there. I'll be a subject for a lot of the life sciences experiments. I'm really looking forward to the physical science experiments. "Before we started doing this stuff in zero G, we didn't really know how fluids worked. We only knew how they worked under the influence of gravity. And now it's literally re-writing the laws of fluid physics." 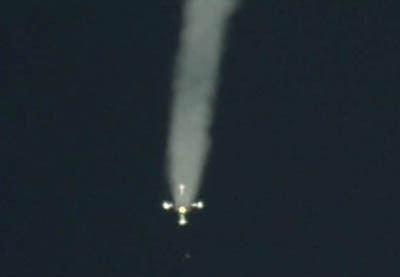 Ford, Tarelkin and Novitskiy have been on their own since Nov. 18 when Expedition 33 commander Sunita Williams, cosmonaut Yuri Malenchenko and Japanese astronaut Akihiko Hoshide returned to Earth aboard the Soyuz TMA-05M spacecraft. As it now stands, Ford and his two Russian crewmates will return to Earth on March 15 aboard their Soyuz TMA-06M spacecraft. At that point, Hadfield will become commander of Expedition 35, the first Canadian to serve as leader of a space station expedition. "The fact that a Canadian is going to command what is in reality the world's spaceship (shows) that Canada is now at a trusted level to be at the top of the space exploration game," he said in an interview. "It has a big impact on Canada."